Blue Microphones are known for their quirky design and, for the most part, their recording quality. I own a Blue Snowball myself and this mic has become one of the standard podcasting miss for new media producers all over the world. 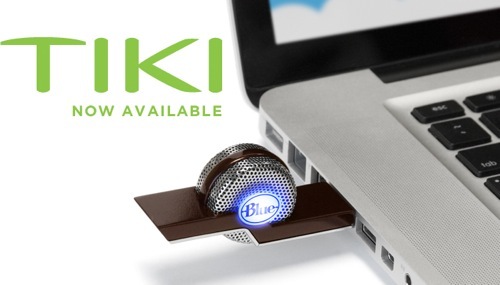 Blue recently released another in microphone in their product line, the Blue Tiki. The Tiki plugs directly into any USB port and provides many special features for podcasters on the go. The new Tiki is the world’s first USB microphone that mimics the intelligence of human hearing by focusing on desired sounds, minimizing background noise and knowing when to mute altogether. Tiki’s two modes give any Skype user, podcaster or musician the versatility to quickly choose the best option in any situation. First, Intelligent Speech Mode brings your voice to the forefront of a conference call or chat while noise-canceling technology simultaneously minimizes unwanted, competing background noise. Natural Recording Mode captures a wide range of sources from vocals to acoustic guitar, recording high-fidelity audio with exceptional clarity. Tiki sets a new standard for crystal clear audio for wherever you go. In my own experience, devices that plug directly into a USB port can be prone to damage due to bumping them into people, furniture, walls, etc. I would probably plug Tiki into a USB extender cable to allow for safer use while also giving me more options for positioning the microphone in each recording situation. Engadget recently had an article on the Blue Tiki. Read it here! This entry was posted in Hardware, New Media, Podcasting, Production, technology. Bookmark the permalink.